We decided to host a swimming pool party at our local CT indoor public pool, Long Street Baths. 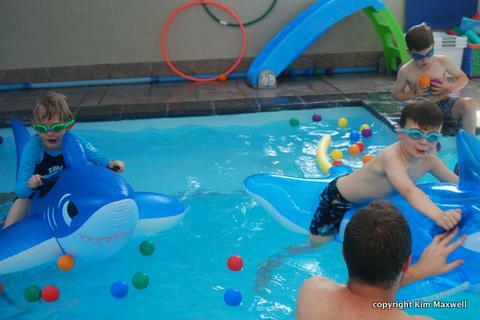 I swim and Daniel takes lessons there regularly, so we know the venue and its lovely staff. A friend with three kids had plenty of pool party gear to lend us. I’d called around and none of the private swim schools could compete in terms of the pool’s generous size. The RSVPs were in, and I’d negotiated a flat rate with the manager to allow all our older kids, parents and even a few younger siblings in. Then five days before the party, a major problem: our Long Street pool was broken and drained of water. No swimming! What a marvelous find this was. Although further out of town for most kids and parents, with an indoor heated 12.5m pool, boy was it a great venue! They offer private swimming parties, and charged a reasonable fee for a set number of older kids and a few might/might-not-swim siblings. They threw in a lifesaver and we were still able to have our coach Allen running the pool activities. 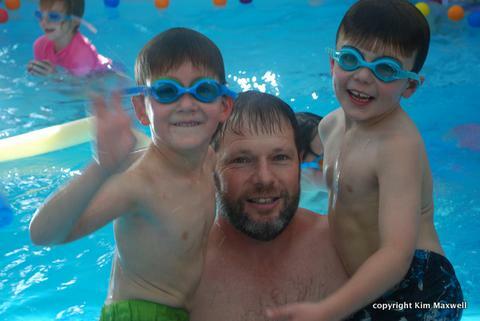 Older kids, siblings and even a few game dads and a grandpa wallowed in the water. We added to the fun with a few blow-up dolphins, colourful beach balls and prizes. 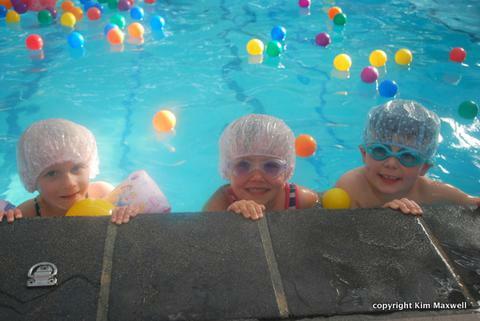 Bring on the Olympics swimming heats – we finished on a high with the shower cap race, for enthusiastic girls and boys! So much for the nourishing ‘healthier’ cheese on grated wholewheat sandwiches and popcorn – when they broke for refreshments and got out of the pool, it was the Flings, my butter-icing cupcakes and granny’s painstakingly decorated biscuits that were gobbled up first. For the swimming pool cake I went back to the beer box recipe from previous parties, baked as a rectangular vanilla cake. It was iced with white butter icing (well, cream, thanks to the butter’s natural colour). Swimming pool tiles and three swimming starting blocks were created from vanilla wafer biscuits iced in brick-like fashion. I mixed a homemade icing gel recipe I found on the internet, made of lemon juice, caster sugar, cornflour, water and blue food colouring. But after a few attempts at boiling it/adding extra cornflour, I gave up on the pool gloop. The lemon juice had turned it a murky green-blue and it wobbled but never really set. I had visions of gloop sliding all over the cake on the drive to the swimming pool venue, so when Daniel declared its tart flavour yucky once too many times, it was binned. Instead, butter icing (I think slightly curdled) with a dash of imported blue gel colouring created a weird frosted effect. Perfect for smearing over the set white icing. Voila, swimming pool ripples. Tasty and pleasing to the eye. 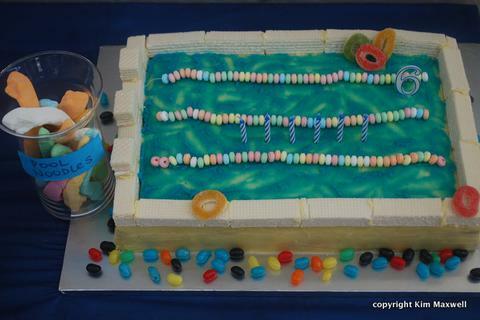 The pool swimming lane floats went on the cake at the venue. Surprisingly hard to find at supermarkets and cake suppliers, I eventually bought these inexpensive sweetie necklaces at King Cake. 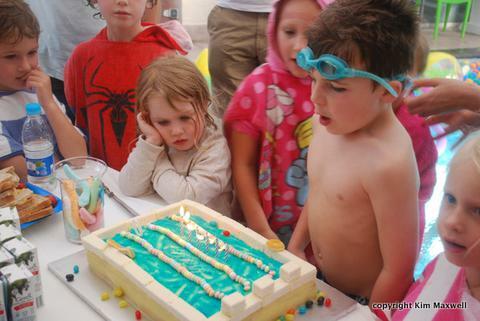 A few jelly ring ‘inflation devices’, and a scattering of jelly beans around the pool cake within reach of little foraging fingers. 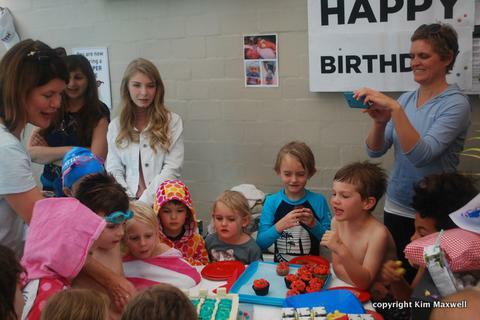 Also see Daniel’s 5th birthday Superman cake and his other party cakes.